I’m not sure how I started reading Italian mysteries. 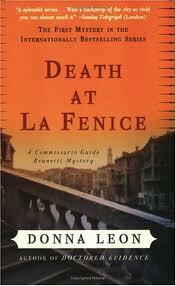 I think that I was given a Donna Leon book for Christmas by my mother-in-law who knows what a raving Italophile I am. Donna is an Italian by transplant not by birth. She has lived in Venice for many years and before almost stumbling into her late stage writing career (she was 50 when her first book was published) she was a professor at the American Military base in nearby Vicenza. Interestingly enough she refuses to allow her books to be translated into Italian and her reasons really make sense. She wants to be able to live anonymously in her neighborhood. You can read more about her if you click here. Still, whether she is Italian or not is really beside the point since her protagonist Commissario Guido Brunetti is certainly that and a native and still resident of Venice. He’s a thoughtful, diligent and honest policeman with a lovely wife who manages to be a professor in Padova and still cook fantastic meals for Guido and the two teenage kids. The family is always part of the background of each book which shows the well rounded life that Brunetti lives. The crimes may be horrific but they are not graphic and the books do not suffer from the lack of description of the nastiness of the crimes. He walks a lot as most Venetians do but does have the opportunity on a regular basis to speed to the scene of a crime in one of the police speedboats. One of the perks of the job I suppose. There are always instances of the venality of the political environment and the stifling nature of the bureaucracy with which both ordinary citizens and the police of various stripes manage to cope as best they can. Brunetti’s superior officer is a (somewhat stereotypical) southern Italian (Napoli I think) who is decidedly furbo (sneaky) and self serving. Brunetti somehow manages to do his job despite him. Another regular character, Signorina Elettra, is the lovely secretary to Brunetti’s boss. She deftly manipulates her boss while at the same time hacking into public and private records repositories to assist Brunetti. The resolution of the cases is not always clear and as in real life the perpetrator may not be caught and even if he (or she) is then there may not be a clear sense of evil. I have found them to be enjoyable reads and like almost everything that I write about would recommend. After all why would I write about it if I didn’t like it? Wait – I may write about Italian politics one of these days so that last hypothetical question may not make sense. Have you found Italian authors that you particularly like? Want to share? This entry was posted on Thursday, October 21st, 2010 at 7:39 am	and is filed under Culture. You can follow any responses to this entry through the RSS 2.0 feed. You can leave a response, or trackback from your own site. I hear a guy named Dante isn’t a bad read. And there’s another guy, Machiavelli, who got some good press. But I hear he can be somewhat opinionated. I’m waiting until my Italian is good enough to read Dante in the original ;^). I did read some of Machiavelli once. As I recall it was a little bit of a chore. Perhaps if I had been able to keep at it I could now be a politician or be appearing as a commentator on Fox news. Joe, I’m a fellow Donna Leon fan. And so I want to let you know about my other favorite mystery writer (of mysteries set in Italy): Magdalen Nabb. Her series is set in Florence, and her detective, Marshall Guarnaccia, sets about investigating crime in his community in much the same way that Brunetti does. Nabb died a few years ago but this series is a jewel. Thanks for bringing her to my attention. I’ve never heard of her but took a look and found that Amazon has a bunch of her books. The local library has some as well which suits me find since I’m a bit of a cheapskate. I’m always excited to find another writer of novels or anything else interesting about Italy and Italians. There’s another writer of Italian mysteries named Andrea Camilleri who I really like and will be doing a blog post on him soon. Il mio italiano non è sufficiente per capire appieno il tuo commento senza l’aiuto di Google Translate. Inoltre, la maggior parte dei miei lettori probabilmente sanno poco italiano. Cerco di traddure questo e’ anche tuo commento con l’aiuto di Google. Ho ancora difficolta’ con la parola “ne” e non capisco completemente la prima parte del tuo commento. Comunque cerchero’ per i due scrittori. My Italian isn’t good enough to understand fully your comment without help from Google Translate. Moreover most of my readers probably know little Italian. I will try to translate this response and also your comment with help from Google. I still have difficulty with the word “ne” and don’t completely understand the first part of your comment. In any case I will look for those two writers. I spoke some time ago, a friend of mine and I found some of hers books in a bookstore and obviously in the department’s “books in English” and I was tempted to read something of hers :^) If you like yellows (mysteries) also try to find Fabio Pittorru and Giulio Leoni who I know have written books in the historical setting (for me the best historical mystery remains “The Name of the Rose”).